To enjoy stunning natural beauty and see energy efficiency in action, visit Zion National Park in southern Utah. 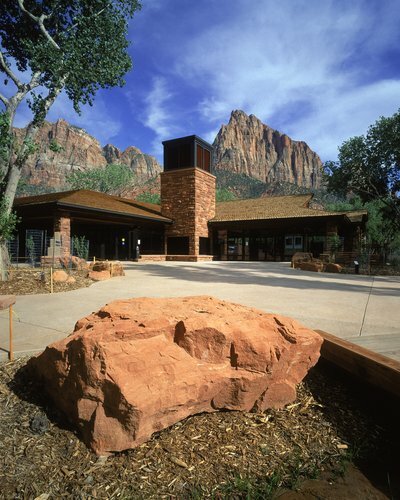 Zion National Park’s Visitor Center is surrounded by tall, colorful-banded, majestic sandstone cliffs and is also a model of energy efficiency and sustainability that features passive solar design. The highlights of the building are the passive solar heating and cooling, a Trombe wall, an active solar photovoltaic array, natural ventilation with clerestory windows and innovative cooling towers. The building uses 70% less energy than its typical counterpart but did not cost more to build. Planning, energy efficient technologies and smart thinking, went into the design of the building. The cooling towers provide natural ventilation by facilitating a flow of air into the building. Because Zion N.P. is situated in the desert, it gets hot in the summertime, with temperatures regularly reaching 95 to 105 degrees Fahrenheit. As the temperature rises, air is drawn into the cooling towers. The pads located at the top of the tower are sprayed with water to cool the hot dry air. The resulting dense, cool air falls through the tower to help cool the building. A computer operates the intake of air by taking regular temperature calibrations, then controls an opening at the bottom of the tower that operates the amount of air that can flow through it. The cooling towers, along with the clerestory windows, help natural air to flow through and cool the building. The winter sun can enter the building, while the summer sun can not. The southern facing side of the building has been designed to allow the lower winter sun’s energy to warm it in the winter, while the summer sun’s heat is blocked from entering the building. 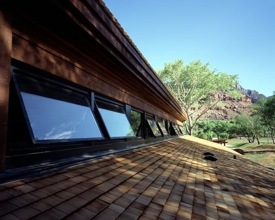 The picture below shows the design and building’s overhang shades the windows from the hot summer sun. 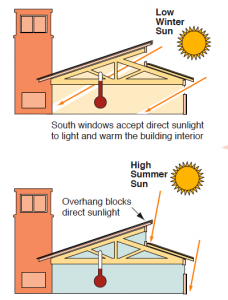 The clerestory windows that help to warm the building in the winter, are utilized differently in the summer to help it stay cool. Being located high above one of the roof lines, they facilitate natural convective air movements to allow warm air to flow out of the building. Within the visitor center, dense materials with thermal mass have been used to help keep the building a stable temperature. A shiny, polished, stained, cement floor with its ability to conduct heat, allows the winter sun’s heat energy to be stored then is released later during the evening and night. Similarly, if the sun is not allowed to enter the building, the floor stays cool. A Trombe wall has been constructed right behind the frosted windows. A Trombe wall has been built on the southern side of the building, located on the lower level. The wall, made of masonry, stores heat from the sun that has been trapped between the wall and the glass. The Trombe wall radiates the stored heat long after the sun has gone down in the winter helps to keep the building warm. The Trombe wall is located on the other side of the shaded glass, is painted black to absorb the heat, and situated inches away from the glass. 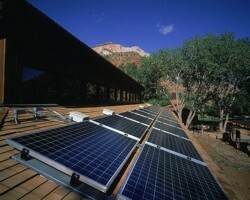 While the Zion Visitor Center is integrated into the electrical grid, it also supplements its energy use with an active solar 7.2 kW photovoltaic (PV) array. The energy collected from the PV array is stored in batteries. This stored energy will kick in and supply the building in case the grid experiences any type of loss. This allows the building to have an uninterrupted energy supply. It sells surplus energy to the utility company. Thick insulation in the form of Structured Insulated Panels, or SIPS, cover the building, while spray-in foam insulation was also used. 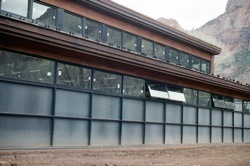 While the Zion visitor center utilizes green and passive solar energy, to further its positive stewardship of the national park, it also operates propane buses to help shuttle visitors through the narrow rock canyons. While being convenient, the propane buses also cut down on carbon emissions in the park. After all, being in the immense beauty of the colorful rock canyons is more enjoyable when they are filled with clean air. The visitor’s center was designed and built in conjunction with the Department of Energy’s National Renewable Energy Lab (NREL). Haven’t been to this national park yet, but this looks like an amazing building. Thanks for the detailed article. The passive solar techniques are impressive. You’re welcome! Hope you get to visit soon. Great article. A building mechanical tour of the lighting/heating/cooling design and operation would be of great benefit. Is this possible? How does the small space between the Trombe wall and the glass remain clean and free of plant life? They might be able to help you more information about the mechanical systems. In regard to your other question about plants growing by the Trombe wall, typically, if there aren’t seeds, a medium to grow in, and water, plants won’t grow.